Designed for sailors, our Offshore Automatic Inflatable Life Jacket offers 35lbs. of positive buoyancy to keep you face up in rough water. Comfort and convenience define this life jacket; with the features you need for offshore conditions, our automatically inflating life jacket gives you peace of mind on the water. Our Offshore life jacket is designed to automatically inflate when immersed in water. The automatic inflator on this life jacket won’t prematurely inflate due to rain or humidity as the inflator must be submerged in water to activate. A built-in, indicator window will show green if your life jacket is properly armed and ready to use. You will want to visually inspect your life jacket for leaks or tears every few months and service the automatic inflator yearly. With a sturdy, integrated sailing harness that includes stainless steel D-rings for attaching a safety tether (sold separately), you will feel safe and secure in your Offshore life jacket. The conveniently integrated harness and stainless steel D-rings are accompanied by dual stainless steel slide adjustments for adjustable durability. Inflatable life jackets are designed to be lightweight and low profile offering maximum mobility. The Offshore's design minimizes bulk so it fits well with your rash guard or offshore jacket. A neoprene neckline offers added comfort and support. With its freedom of movement, you can wear this life jacket comfortably for extended periods of time without noticing it. Constructed from 400-denier nylon Oxford material, the Offshore life jacket will endure years of wear in harsh conditions. 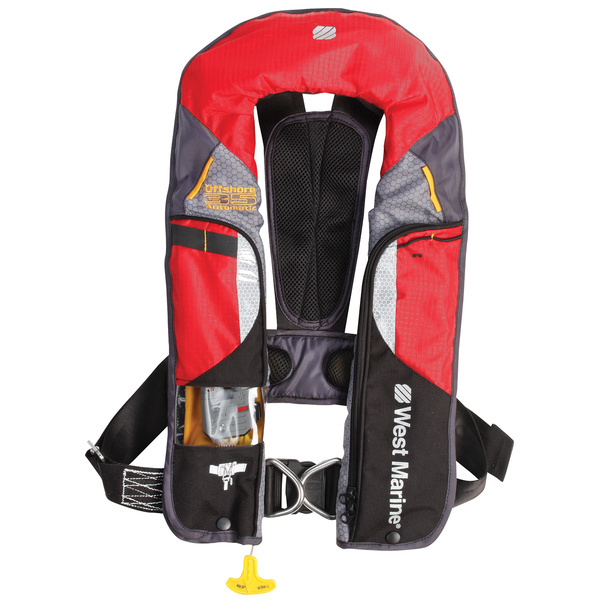 A 2" nylon body strap and 1 1/2" polypropylene webbing on the integrated sailing harness help make this life jacket sturdy and durable. Fits a wide range of chest sizes from 30"- 52"
For more information on USCG approval types and why you should always wear your life jacket when you are on a boat, see “Think Safe - Choose the Right Personal Flotation Device (PFD)”.